Would you like to see your baby grow up healthy without suffering through avoidable medical concerns? If your answer to that question is yes, I urge you to continue reading this review. Infants are more sensitive to germs and bacteria, so it is important to invest in a sterilizer to ensure that your baby is not ingesting contaminated food. 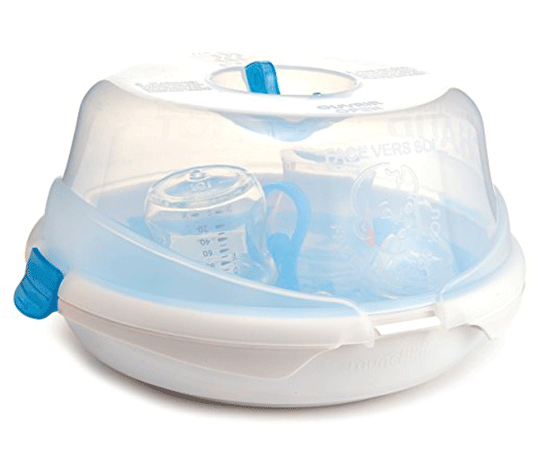 In this age, sterilizers have become popular among parents that want to disinfect their baby’s bottles and accessories. 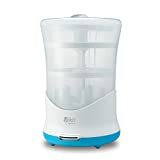 The Philips Avent is a sterilizer built for efficiency to ease your workload. It comes with a variety of features such as an integrated dishwasher basket and a defroster that make it worth the consideration if you’re in the market for a sterilizer. 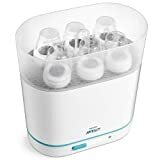 With the Avent sterilizer, you can kill all harmful germs in just six minutes and keep the sterilized content free from germs for 24 hours. 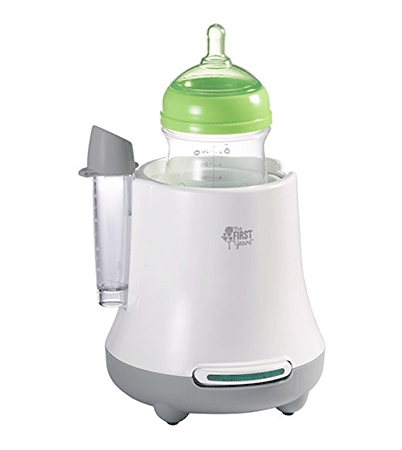 This sterilizer allows you to defrost frozen baby food as well as letting you warm baby food and milk evenly. 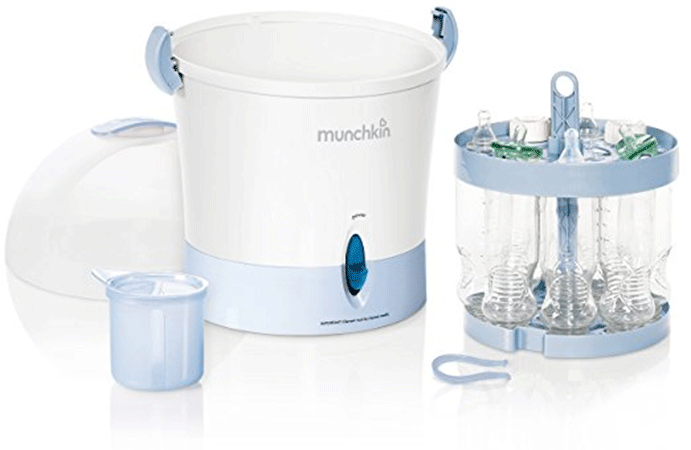 Being one of the best-priced sterilizers on our list, the Munchkin represents great value for money. You can use it to disinfect breast pump parts and a whole day’s worth bottles thanks to the large open design. The Munchkin is easy to use and runs quietly and quickly such that you can disinfect all your items in under ten minutes. 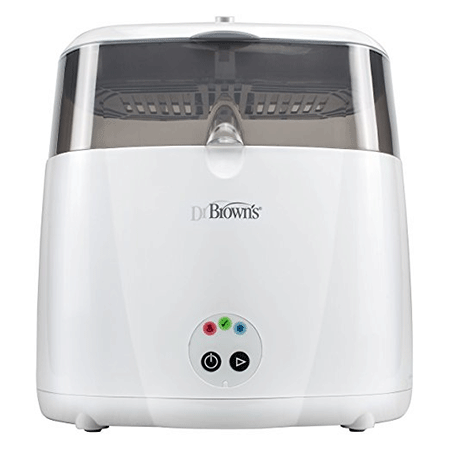 For an entry level Sterilizer, Dr. Brown’s Bottle sterilizer is extremely reliable. It has a sturdy build, and the price is just right. Unlike other sterilizers which come equipped with an exposed heating metal coil, this unit comes with an enclosed heating element to prevent the buildup of deposits. Perhaps the only disappointment is that unlike other sterilizers that provide you with the flexibility of disinfecting various objects, the Dr. Brown can only hold bottles. 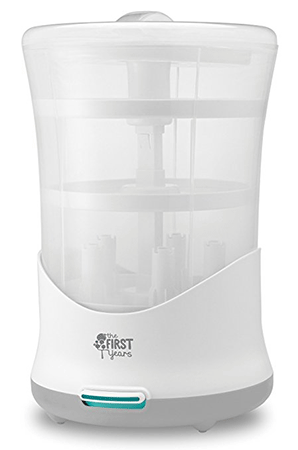 The First Years sterilizer excels at killing household germs and bacteria. This sterilizer is ideal for disinfecting babies’ feeding and playing equipment. Since babies like putting all sorts of things in their mouths, it is vital to sterilize all their toys without the use of harmful chemicals. This Sterilizer uses steam to disinfect your baby’s tools in minutes without the use of chemicals and solutions. 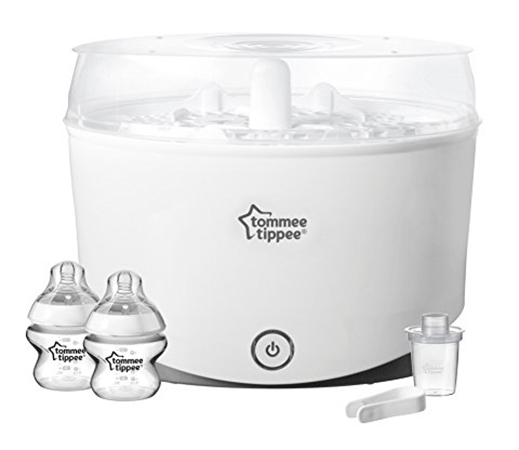 If you’re a new parent and you feel the overwhelming need to sterilize everything for your baby, this Tomme Tippee will serve you well. Unlike other sterilizers which come with unnecessary tools and features, this sterilizer comes equipped with the essentials. It has a simple design with intuitive functionality. It holds a decent amount of space to sterilize up to four bottles and other accessories in just for minutes thanks to its powerful heating system. What’s more is that it comes cheap. 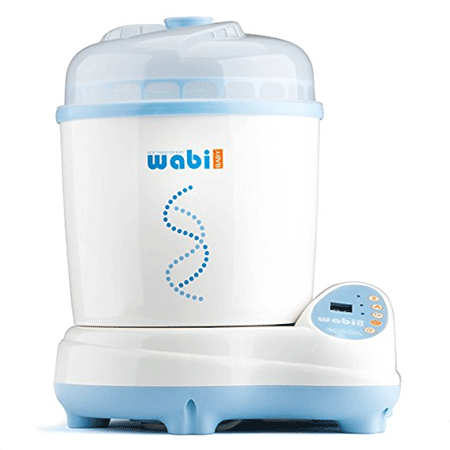 Despite its higher price, I would recommend the Wabi electric sterilizer to any new parent. Once you get to use it, you will completely forget its price and realize its great value, especially with its dryer. Unlike some sterilizers that leave your items wet, this unit leaves them completely dry therefore eliminating the chance of bacteria forming. 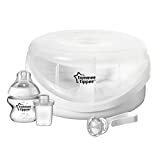 This sterilizer allows you to steam bottles and accessories for your baby and dry them at the push of a few buttons and your set. If you are blessed with twins and need to sterilize two sets of baby equipment at one go, you should consider the Munchkin Steam Guard. It has a big enough, square inside to fit your twins’ equipment but is not too big to cause a nuisance on the kitchen counter. As a parent with lots of things to think about, you will appreciate its simplistic one button design to start the sterilization process. Its adjustable tray will ensure you fit all your twins’ accessories for sterilization. 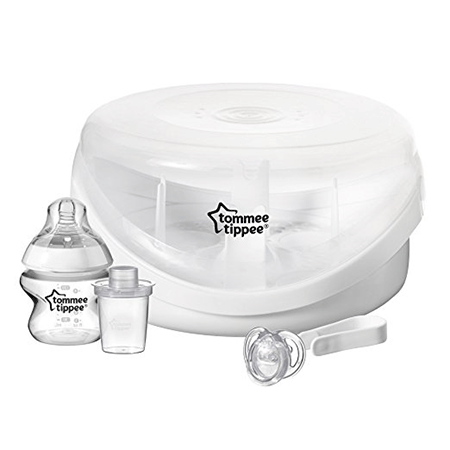 Perhaps the exterior design is the least significant factor to consider when buying a sterilizer, but the Tommee Tippee looks sleek with its oval shape to mimic closer to nature bottles. The Tommee Tippee is bigger than it looks in the pictures so don’t be shocked when you receive it or think they’ve sent the wrong item. Other than its deceiving size, I recommend this sterilizer for parents with medical needs children. You can fit the medical equipment, bottles, and accessories as well as pumping equipment in just one load. Have you ever tried boiling your baby’s bottles and accessories? It can be daunting and even considered dangerous when doing it exhausted. 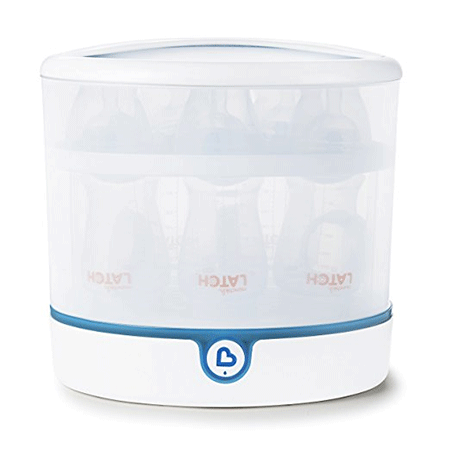 The Munchkin microwave sterilizer helps simplify your sterilizing process. 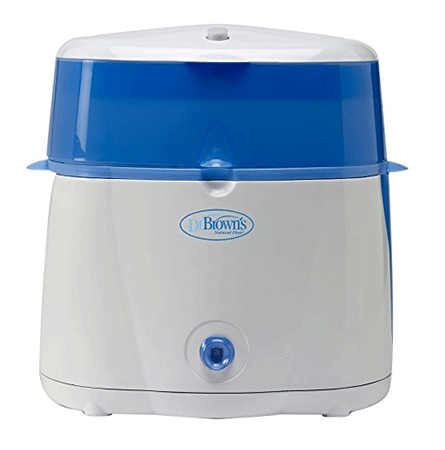 Unlike boiling which requires you to do multiple things, this sterilizer is simple to use. You simply pour half a glass of water into the container, drop your bottles and accessories, hit a button, and you’re done. 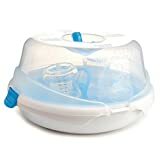 It also offers versatility to sterilize various objects such as breast pumps and other baby accessories. 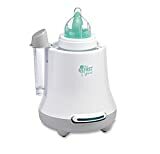 You should consider buying this bottle warmer for your baby if you prioritize the quality of your baby’s milk than convenience. 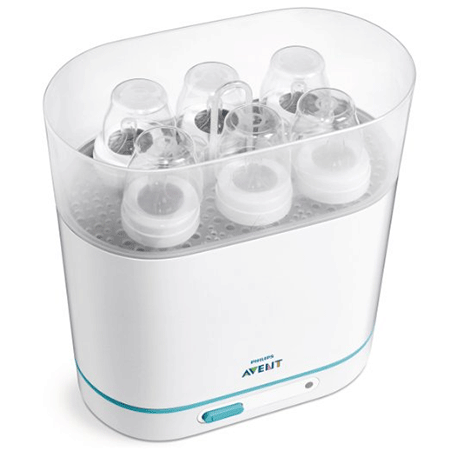 The Philips Avent warms the milk evenly with a circular motion to ensure that there are no hotspots on the milk. You can use the medium and low temperature setting to warm up to six ounces of refrigerated milk in under five minutes. You can also use the higher temperature setting if your baby is persistently hungry for a faster warm. The bottle will automatically switch off 20 minutes after warming for safety and power efficiency. 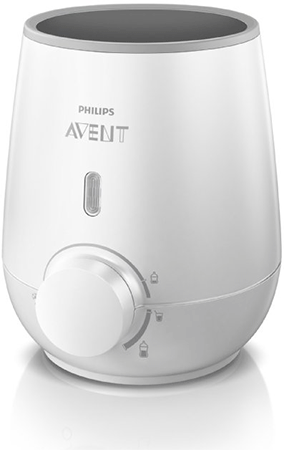 This 3-in-1 Avent carries on the tradition of Philips producing compact sized appliances. Its shape and design are sure not to take up too much space in your kitchen area. It features an adjustable basket to allow you to customize it according to your needs. It comes with useful extras such as a dishwasher basket for easy pre-cleaning and a microwave steam sterilizer for added sterilizing convenience. 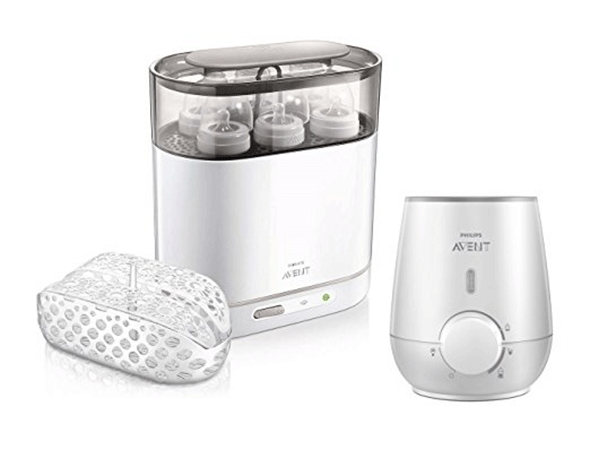 Unlike other sterilizers, this 3-in-1 Avent comes with an advanced digital display to provide feedback when using. First on our list is the First Years bottle warmer because it not only is the best seller but works extremely well and represents the best value for money for out of all the products we tested. Unlike other bottle warmers that mess up your kitchen counter, this bottle warmer has no spill offs and that leaves your kitchen counter clean. It operates on steam to warm rather than traditional submersion into warm water for heating. The advantages of steam heating are that it is faster and without spillovers, meaning you can use it on wooden surfaces without the fear of ruining the surface. The main focus of buying a sterilizer is to sterilize your baby tools and equipment. 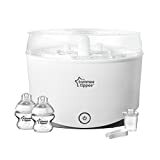 But since all sterilizers work on the same principle, we have indicated in this review what each product is suitable for to leave you in a better position to pick out the sterilizer you think will suit your child best.